The video was posted a day after Trump criticised Google multiple times on Tuesday, accusing the company of rigging search results to silence conservative media outlets and make his administration look bad. 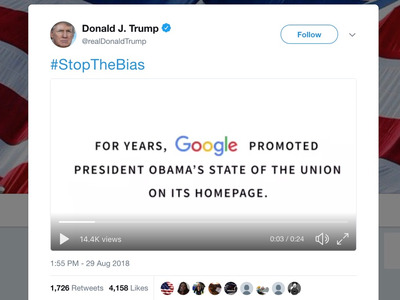 A screenshot posted to the “r/The_Donald” community on Reddit seems to indicate that the Google homepage did indeed promote the State of the Union address in January 2018. Trump’s attack on Google appears to have been coming for a long time. Conservative pundits have long accused Google, Facebook, and Twitter of showing preference to left-leaning news outlets and causes. Another factor that has helped further the narrative that Google is biased is that the company has had strong ties in the past to Democratic politicians, including Obama and Hillary Clinton.